From top to bottom, the design for the Journey theme began with a focus solely on travel. 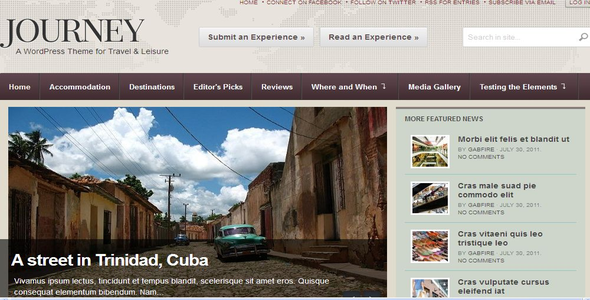 We weren’t going to give you just a standard blog with a pretty scenic picture and call it a travel theme. Journey’s sleek design is perfect for the avid traveler as a blog or magazine, and can even be used by travel agencies to showcase the top destinations in the world. Three different category layouts. Choose between Media, Magazine or Default category templates to give a unique look to inner pages.